Valentine's Day is growing near! See what we've got for your honey! Valentine’s Day is growing near! See what we’ve got for your honey, Pretty baubles & lovely colors that are sure to please all Storm Shadow’s Jewelry originals! Show her you care with these pretty baubles from our Valentine’s Day Section. There are many more lovely items that are available in our store that she may love as well. Here are just a few of our lovely items that you may like for your sweetheart. 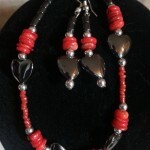 Our Hearts and Red Bamboo Necklace and Earring set is sure to please with Hemalyke Hearts and barrells, and Red bamboo Coral discs, the set includes a necklace and matching earrings. This is a lovely set that any lady would love to have. 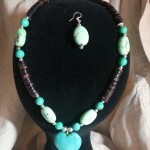 Turquoise My Heart Necklace Set. If you want to stray away from the red color of Valentine’s Day and go for something different try our Turquoise My Heart Necklace Set. Made from Turquoise, Brown Penshell Heishi and a beautiful Turquoise Heart pendant hanging in the middle she won’t be able to resist how beautiful it is. If a set is not what you’re looking for then try one of our darling pairs of earrings such as this darling pair of Carnelian Heart and Hemalyke Earrings. 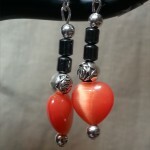 Made from Carnelian hearts & Hemalyke barrels you will fall in love with them at first sight. This is a original pair made by my Mother, and there will be no others made like them.. so hurry and be the one to buy them for your gal. 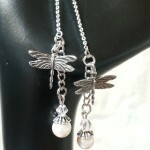 And last for featured items today we have a delicate pair of Dragonfly Pearl Threader Earrings, these beautiful pale pink earrings are made from dainty pink glass pearls, Swarovski crystals and adorably cute tiny dragonflies who wouldn’t love them. We still have free shipping for our US customers for Valentine’s Day. FREEUS is the coupon code. This is for our Valentine’s Day orders only at this time and this coupon expires on 2/10/2015. Check out our Valentine’s Section to see what all we have slashed. 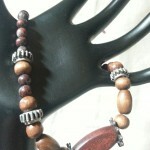 Dragon Blood and Wood Bracelet. But if you’re looking for something for that special man in your life we do have a few items for him as well in our Men’s section, such as this beautiful Dragon Blood and Wood Bracelet. Perfect for any man that is a fan of mechanical objects like cars, bikes, or anything that has a gear in it. Don’t forget we do offer custom work as well, currently we are only offering it for Valentine’s day for our US customers so that they can get their items on time. You can contact us through our Customer order page. We still have our buy any 3 items from our sale pages ( $10 sale , $5 sale items or $20 sale items) you will get 30% off just use 30off when checking out with these items. And our Free shipping if you buy $50 worth of items freeshipping. Plus if you do that and buy up to $50 doing that you can get free shipping and 30% off as well. This is on all the time. We are connected to Twitter , Facebook , and Pinterest so you can catch us there anytime. Check out Patreon to see what it is, and come support us there we need it! Patreon Patrons get extra Coupons, Discounts and goodies each month. Next post: Coming Soon! Bright Colorful Chain Maille Items for your enjoyment!